Just another case of Greco-Roman tradition of lying and deceit when it suites them. Continuity, Continuity. The more things change the more they stay the same. 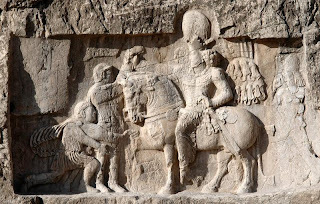 Maria Brosius in her book "The Persians" writes :historical reality and the preservation of the image of Rome as thesole (and invincible) world power.In actual fact, Philip the Arab immediately sued for peace. Heagreed to pay a ransom, and probably had to concede Roman territoriesin Mesopotamia and in Armenia to the Sasanians.Even more revealing is the fact that Roman sources completely *deny* the defeat at the hands of the Sasanian king, and in a blatant reversal of historical truth even claim a Roman victory over the Sasanians. Roman *propaganda* continued to maintain a strong grip on the dissemination of the facts at the cost of historical reality and the preservation of the image of Rome as the sole (and invincible) world power. In actual fact, Philip the Arab immediately sued for peace. He agreed to pay a ransom, and probably had to concede Roman territories in Mesopotamia and in Armenia to the Sasanians.